For families with young children, mealtimes are often the scene of some of the greatest stress-filled battles. I’ve heard over and over from well-meaning parents who struggle with feeding their little ones. Everyone knows that fruits and veggies are the cornerstone of a healthy diet, but parents often say that these are the least popular foods with their kids. It’s common to hear of negotiations with kids to eat “one more bite” of broccoli so they can have dessert. Some children will only eat one favourite food, and everything else gets pushed around on the plate. When mealtime turns into battle time, everyone loses. I want to share five simple and proven ways to end the struggles and make eating happier and healthier for everyone. Each reinforces an important point that often gets lost in the frenzy and focus of the latest nutrition news and trends: How we eat is just as important as what we eat. Believe it or not, you are the biggest influence on your child’s evolving relationship with food and eating. Your concern for their well-being can season the air around the table with a ton of tension. That’s not a great recipe for success. Imagine how you would feel if someone was watching over you and commented on everything you ate or left on your plate. Would you want to eat “one more bite” if you just weren’t feeling hungry? Now imagine you didn’t care what anyone was eating. Would things feel different? They would for your kids, that’s for sure. Instead of focusing on the food, make mealtime about being together and enjoying each other’s company. Chat about your day or share funny stories. When you’re relaxed at the table, your kids will be too. If the focus is taken off the food, kids are more likely to dive in and eat what’s in front of them, and to experiment with new or unfamiliar foods. 2. Expose kids to new foods and…repeat. We all like what’s familiar to us. The most powerful strategy to get your kids to embrace new foods is to make foods available to them over and over again. The average child needs 15 tries before they’ll accept something new. (The key word being average, which means that for some kids, it may be 20 or even 30 tries!) Resisting new foods is normal behaviour. To learn to like something new, kids need repeated exposure, without any pressure. 3. “Play” with your food. Most of us don’t eat foods simply because we know they’re good for us—we eat what’s appealing. The Rainbow Plate approach to food education is to encourage kids to use all their senses to explore and experience foods. At home, instead of talking about vitamins or asking your kids why they don’t like a particular food, encourage them to explore and describe what they see, feel, smell, and taste. Are you dazzled by the incredible design inside a purple cabbage? Did you notice that cucumbers smell like summer? Can you taste the cinnamon flavour in a parsnip if you close your eyes? Have you ever stopped to feel the delicate texture of a kale leaf? Making food an adventure and allowing kids to “play” with food is a fun and proven way to engage kids and help them open to eventually eating a wide variety of foods. Disney got it right with this popular tune. One of the most effective strategies you can adopt is to let your kids be in charge of their own eating. 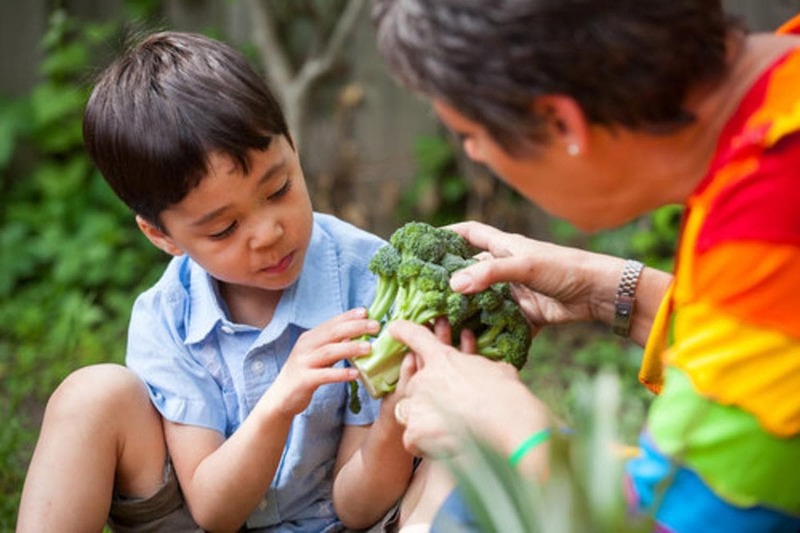 Helping kids tune into their bodies and to be able to recognize and respond to the cues of hunger and fullness is so important in helping them to develop a lifelong positive relationship with food. The simplest way to do this: offer a variety of healthy foods at regular meals and snacks, and then simply sit back and allow your kids be in charge of how much they’re eating from what’s on offer—or even whether they eat at a particular meal. It may take some time, but parenting is a long game, right? If you do your job and trust your kids, they’ll show you that they can eat what their body needs and will embrace a variety of foods over time. 5. Involve kids in planning and prep. Kids love to eat what they’ve helped make, and even the tiniest hands can do something to pitch in for the family meal. Let your little ones wash, tear, mix, stir, and even chop food for a salad or simple meal. (Bonus: they’ll nibble and taste as they go.) Let them put together a colourful creation using a rainbow of fresh veggies or fruit, and see how their imagination sparks excitement. Go on a market or grocery store adventure to pick out new and fun foods to work into your recipes. Look for something unusual and focus on the bounty of the seasons. The bottom line? Take a deep breath, smile, and relax around food. If you chill out at the table your kids will too. That’s what I call healthy eating. Janet Nezon is a former academic nutrition lecturer and health promotion expert. She holds a B.Sc. from the University of Toronto as a Specialist in Nutritional Science, and a Master of Health Science degree in Health Promotion, from U of T’s Faculty of Medicine. She is the founder of Rainbow Plate, supported by the Rainbow Food Education Foundation, to engage children and adults with real food in an innovative way that is evidence-based, simple and fun. Sign up for the Help! newsletter to receive more articles like this to your inbox, plus exclusive offers.